You are currently browsing the Carpe DMM blog archives for April, 2017. We got up a little lazily, and didn’t head down to breakfast until about 08:00 after having showers and dressing for a day in Monaco. The breakfast buffet served in the hotel restaurant was similar to others, but with a bigger selection of chopped and fresh fruits, and also pancakes. I had some muesli with fruit salad and yoghurt, and then tried the pancakes with maple syrup. They were luke warm and really not very good; thin and dense, almost more like small crepes. M. had some slices of bread with Nutella after some cereal. I also had a banana, since they were amongst the available fruits. The hot food selection includes sausages, eggs, bacon, mushrooms, and potatos, but I didn’t have any of those. After eating, we set out for a day of walking around Monaco. 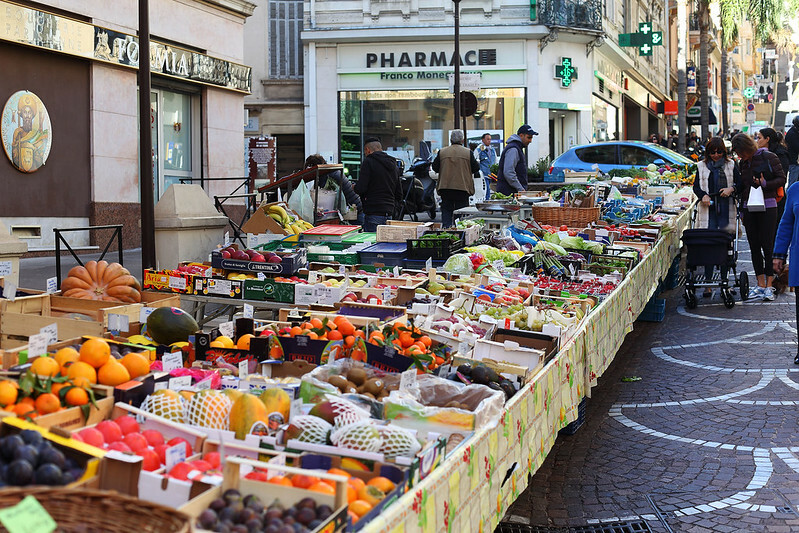 First we headed over to Avenue Saint-Charles and the Église Saint-Charles, where there was a farmers’ market in the morning. This turned out to be quite a small affair, with just seven or eight fruit and vegetable sellers and a couple of flower stalls. They had some interesting things though, like really long skinny zucchini with the flowers attached. We walked through the stalls and then entered the side entrance of Église Saint-Charles to have a look at its interior, before exiting from the front to see the facade before continuing our walk. Here in Australia, scripture is still taught in schools. One of the problems with this is that scripture classes eat up some of the scheduled classroom time, and children whose parents don’t want them to attend religious education are specifically not allowed to do anything during that time which might give them an academic advantage over students attending scripture. So the students not attending scripture are typically not allowed to use that time to study, or do homework, or do anything else that might be “educational” in some sense. Often they just sit in a room and watch videos. About 15 years ago, a group of people decided to do something about that and offer secular ethics classes during this time when other students are doing scripture. Since the scripture classes purport to be offering ethical education, it couldn’t be argued that the non-scripture children were doing anything additional. However, this campaign fell foul of religious interest groups, who felt that ethical instruction without religion was inherently evil or something. The religious groups fought long and hard to have secular ethics classes banned from schools. I’m pleased to say, however, that they lost the fight and some years back a completely non-government-funded volunteer group called Primary Ethics was granted permission by the NSW Department of Education to offer ethics classes as an alternative to religious scripture in New South Wales primary schools. The curriculum very specifically does not attempt to teach children “what is right” or “what is wrong” – rather it teaches them skills in critical thinking, and that many issues are complex and that not everyone agrees on what is right or wrong, and the value of considering things from other people’s points of view. Since its inception, Primary Ethics has grown to be extremely popular, with many parents (including many religious ones) wishing to enrol their children in ethics classes. The problem is, being non-funded, Primary Ethics needs volunteers to actually teach the courses. Recently, I volunteered to become an ethics teacher, and I just completed my training (which includes federal police background checks and clearance to work with children). I will be starting tomorrow, with a class of Year 4 students (about 9 years old). I’m proud to volunteer my time to teach a new generation of people the principles of ethics and critical thinking, and I hope they all go on to become better adults because of my efforts. Some years ago a friend recommended to me the band The Duckworth Lewis Method, and their self-titled album. He described it as a “cricket concept album”, which made sense, as it was named after what has become the most common rule governing run targets in rain-affected one-day cricket matches. I bought the album, and I enjoyed it – it’s a folky mix of songs about cricket, with lyrics full of cricket jargon and a very tongue-in-cheek sense of humour. Anyway, yesterday I was browsing around on iTunes, and I tried entering “Duckworth Lewis Method”, and I discovered they’d released a second album – back in 2013 – called Sticky Wickets. Since I liked the first album so much, I decided to buy it. I was listening to the album for the first time, and the 8th track began, a song called Line and Length. As I listened to the lyrics, an odd feeling of recognition came over me. The lyrics seemed to be using the definitions of the cricket jargon terms “line” and “length” from Wikipedia. The line of a delivery is the direction of its trajectory measured in the horizontal axis. The length of a delivery is how far down the pitch towards the batsman the ball bounces. Then I realised why the words sounded so familiar. I checked the edit history of the Wikipedia article. I had created that article, on 5 November 2005. I had written those lines. Here’s the exact edit where I added those lines. Holy cow. I wrote the lyrics to a song by The Duckworth Lewis Method. We woke up a little later today, getting up only after 07:00. After showering, we went down to breakfast and filled up for the day. They had some chocolate biscuits half dipped in chocolate, and I had to try one, and it was good. I noticed while having breakfast that the hotel dog was in the kitchen next to the breakfast room; I guess that’s just a thing that happens in Italy. I wondered aloud if they had bananas, and M. said yes, there were some in the fruit basket. I got one and returned to the table. M. said I could save it for later… just as I cracked the stem to start peeling it. I realised saving it was probably a good idea, but it was too late now! So I had to eat it right away. We packed our bags and checked out. We decided to walk over to the Arione shop to get some photos of this historical place, and by the time we got back to the car it would be after 09:00, when ticketed parking started. So M. fed the meter to get a ticket, with the help of the hotel guy. He’d also helped us take our luggage out to the car, and had generally been very friendly and helpful. Unfortunately when we arrived at the Arione shop, it was shuttered, and a check of the hours revealed that it didn’t open on Mondays until 12:30! So I took some photos of the posters outside, and we walked back to the car. This led us past two chocolate and pastry shops there were open, right next door to each other. Both also sold cuneesi al rhum, but what caught my eye was bottles of amaro bitters of various brands in one of them. It sold small bottles, and I decided to get one to take home. After purchasing this, we went to the car and drove off, heading towards France. We drove up into the Ligurian Alps, passing the last Italian town of Limone on the way to the border. 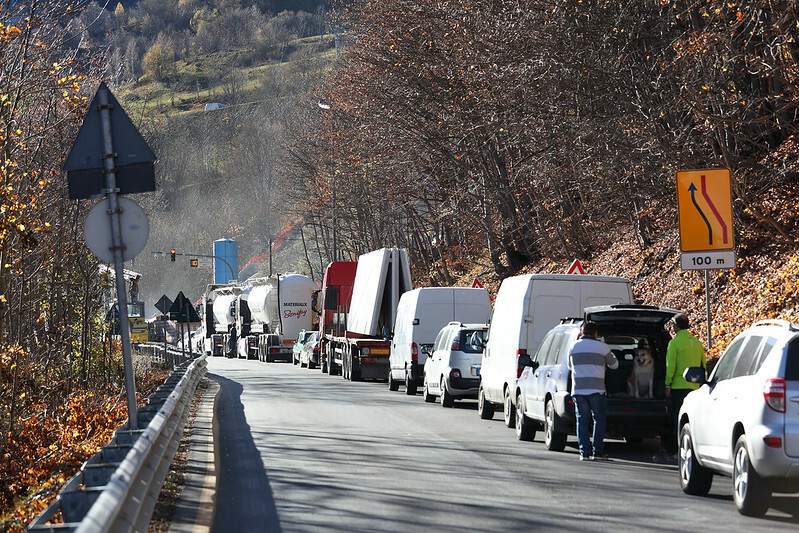 Just before the Col de Tende pass at the top of the valley, we ran into a queue of cars, stopped at a red light. Next to the light was a display showing the number 14. After a few seconds, I divined that the 14 was indicating how many minutes until the light would go green and we could proceed through the tunnel immediately ahead. Seeing others ahead of us turn their cars off and get out for a stretch, I did likewise, taking the opportunity to take some photos of the scenic valley with the forest around us. One guy ahead of us let his dog out for a walk too. We got up just before 07:00 and had showers before descending to the breakfast room. We had cereal and cornetti, and I tried making a toasted cheese roll in the sandwich press, but it wasn’t very hot and the cheese didn’t melt at all. Before leaving La Spezia, we walked back to the bakery where we’d had lunch yesterday, to buy some things to take with us for lunch during today’s drive. We asked what the brown focaccia-like bread was that yesterday the lady seemed to be saying was filled with cherries. After some to and fro with language, we determined she meant cereals, that it had different grains in it. M. got a slice of that, while I chose a slice of one that looked like it had cheese with lumps of feta on it, and the woman said “Gorgonzola” as she cut a piece for me. Taking these back to the hotel, we repacked our bags to fit all our new things and our freshly cleaned laundry in, then checked out and headed off in the car. Navigating out of La Spezia was not too difficult, and we picked up the autostrada north of the city, where we’d got off it the other day when we’d arrived. We took the route towards Genova, west along the coast. The road was good, passing over many viaducts and through lots of tunnels as it cut through the rugged coastal landscape of hills and steep valleys. We saw the Mediterranean Sea a few times but never got really close to it. After an hour or so of driving, we passed Genova, skirting around the edge of it. This was a tricky bit of navigation, as there were several exits and forks and they all had place names we didn’t know. M. used Google Maps to assist and we managed to pick the correct forks, which followed signs pointing to Ventimiglia. (I checked where Ventimiglia is later, and this was certainly the right direction, as it’s the last large Italian town on the coast before the French border.) However we didn’t follow the coastal road all the way, but instead turned inland at Savona, heading towards Turin. At a rest and fuel stop along this road, we stopped for a break in the drive. M. got a cappuccino in the roadside bar. While she drank it, I spotted packs of Fonzies, the Italian equivalent of Twisties, in the same distinctive red and yellow packet. I had to get a pack to try them, so she paid for one when she paid for the coffee. I ate them outside, while M. had two pocket coffees for some extra coffee hit. While eating the Fonzies, I noticed an area near the car park which was specially set up for dogs, with a tap and water dishes, and even a special wooden pole for them to relieve themselves on. There was quite a graphic cartoon picture showing a dog using the pole, on a sign nearby. Returning to the autostrada, we continued northwest until a turn off to the A33 route west to Cuneo. 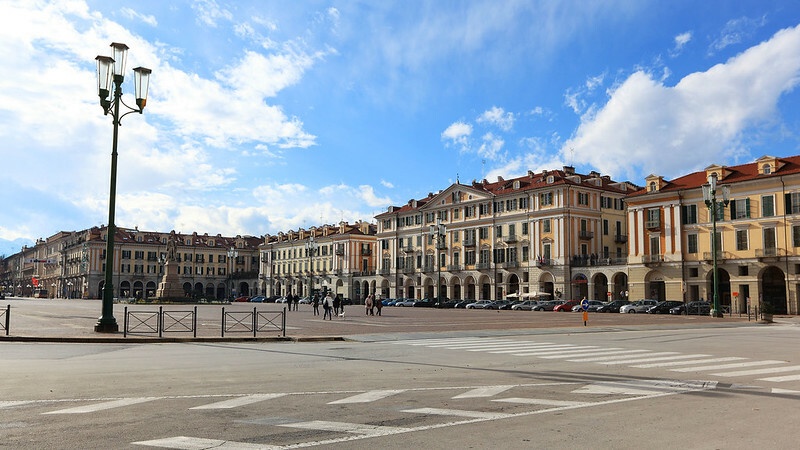 As it turned out, Cuneo was the end of the line for the autostrada, as it simply ended with a toll plaza and then turned into a regular road. This time the toll was €25, which I paid with an Amex card as the only booth with human assistance was closed. The toll machine worked fine thankfully. We rose just before 07:00 this morning, to the sound of heavy rain outside. It had moved in during the night and looked set in for the day, as the forecast had predicted. We showered and went down to the breakfast room to see what was on offer. There was no hot meal option, unless you counted various cornetti in a warmer so that they were warm as though freshly baked, or the sandwich toaster press with which you could assemble your own toasted sandwiches if you had such a desire. But certainly no eggs or bacon or sausages. There was however a bran flake cereal with fruit pieces in it, which both M. and I had. The yoghurt I added to mine was very runny, and I almost spilled the first tub all over the place as I tipped it over the cereal, expecting to have to use a spoon to coax it out of the tub, whereas it actually came pouring out rapidly. M. told me the cornetti she had were nicely warm, so I grabbed a chocolate one. These Italian cornetti are sort of like croissants, but straight rather than curved, and quite a bit smaller. At this hotel, like the last one, there was also a large tart with apricot jam on it. The Italians sure love their apricot jam, it being the typical filling for cornetti con marmellata as well. After breakfast, we packed a paper bag with dirty laundry and went for a walk in search of a laundry that would do a bag wash for us. Google indicated two dry cleaners nearby, the nearest just a block away, named Casa della Penna, and a second one three blocks in the opposite direction from the hotel, named Lavanderia Everest. With umbrellas raised against the heavy rain, we tried the nearest one first, but couldn’t see a laundry anywhere near Google’s indicated location. I went into an open pharmacy and asked a lady in there, “Sto cercando una lavanderia, il nome è Casa della Penna.” This seemed to confuse the woman for a second, before she began saying in Italian that there was no laundry nearby, and that Casa della Penna was a “negozio”, a shop. I didn’t fully understand her Italian but got enough of a gist, and asked where was Casa della Penna? She pointed at a shop just across the street and down a couple of doors. We looked and sure enough, it had “Casa della Penna” above the door. But far from being a dry cleaner, it was a fancy pen shop, selling Mont Blanc pens and other similar items of luxury! No wonder the lady had looked confused when I asked about a laundry by that name! I’d thought “Casa della Penna”, or “House of the Feather”, was an odd name for a laundry, but now it made sense as a fancy pen shop, as “penna” is also the Italian word for pen.